When I just started as a freelance writer, I searched the web a lot trying to find well-paying jobs that wouldn’t turn out to be scams. I spent a lot of time just trying to get a direction on how to work from home as a writer. 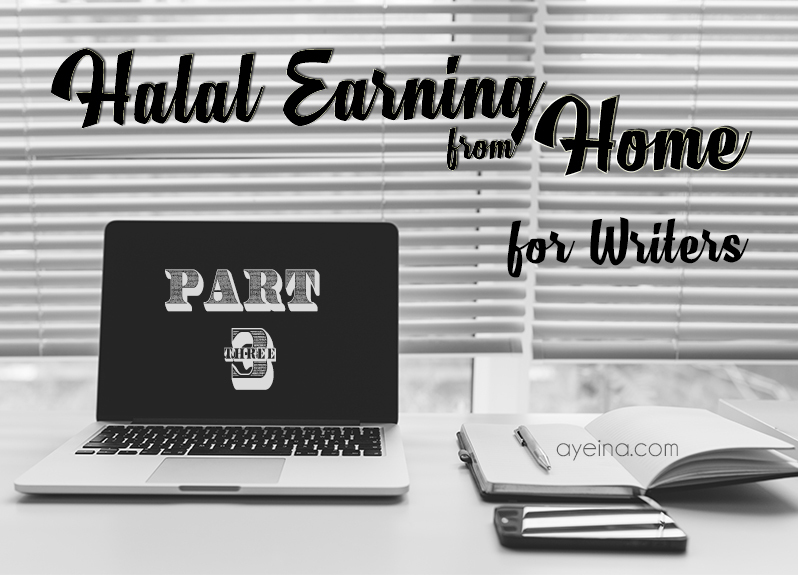 I believe that this post should help you start that journey towards earning a halal income as a writer much quicker and easier than it was for some of us. Generally, you can sign up to the newsletters mentioned in Part1, where you will receive different “call for submissions” from around the world! You can be a copywriter, write a book, become a children’s book author, start a blog, write articles for different sites or simply enter different writing contests every now and then. Blogger, Researcher/ Editor/ Proofreader, Novelist/ Children’s Book Author (or any book in general – be it self-help or a biography. The choices are endless), Copywriter, Ghostwriter, Writing Coach, Poet/ Nasheed writer, Article Writer/ Freelance Writer, Reporter/ Columnist, Screenwriter etc. No matter what category you choose, you can enter different writing contests every now and then. Something we’ve already discussed in the previous article. It gives you the practice you need and the credibility if you win. A niche is a specialization, and for writers, it is an area of writing that you chose to specialize in. The type of writing that you would like to choose. You can write about virtually anything on the internet these days, so finding a topic that fits you isn’t so hard. There are several ways to pick a niche and you can use these to decide which topics suit you best. · What do I like to talk about? People have picked their writing niche from topics that they are passionate about. Do you enjoy reading about a particular thing and can hold conversations about it? Do you see yourself constantly talking about it for the next few years? Then that could be a niche for you as a writer. · What job experiences do I have? Most people who take the plunge to go into freelance writing tap into the experience that they’ve had working in a similar role. If you have worked in a newspaper company, digital marketing agency, corporate communications of a company, you can harness your experience in those fields. · What is my educational background? College degrees in the traditional sense do not really matter to a writing career, but your course of study can help you decide a niche. · What topics interest me in the real world? For example – You may be fascinated by virtual reality technology, even if you have no prior knowledge of it. If you can be committed to learning all you can about a topic, then that can be a niche for you. · What experiences have shaped my life? People have started and built their freelance careers based on their experiences in life. So a person who has experienced extreme weight gain/loss could choose to specialize in writing about health and wellness. All these questions will help you determine what you would like to write so that you can direct your focus into a search for lucrative markets in your niche. There is the question of choosing more than one niche, and veteran writers will tell you that it is not advisable to pick more than one. So, if you want to write about mobile applications, so market yourself for what you write best. I don’t believe that this is completely true. You may have more than one topic that you are interested in, and are able to find a way to make them work together. I write about mobile applications, parenting, and Islam. These are three different niches in different markets, but because they are topics that I am familiar with and interested in learning more about, I can easily combine them. This is a very important step to the success of any writing career. Prospective clients will want to see the type of writing that you have done in the past so that they can judge your expertise. You need to have clips ready to show whoever asks for it, whether online or offline. The dilemma with new writers usually is that you need a client before you can have a published sample. Or at least that is what people seem to think. You do not need to have a client or get a gig before you can have published samples. You can start a blog and write on the topics that you would like to get clients for. So someone in the health and wellness niche can start a blog on exercising, eating healthy, etc. With that, you can market yourself to prospective clients with clips in their niche to present as samples. You can also include a “hire me!” button on your blog, so prospective clients who read your writing know that you’re a writer for hire. Alternatively, your social media accounts are also a way of having published clips. If someone were to be looking for a writer in the digital marketing niche, the way that you handle your own social media accounts will say a lot about your expertise to a prospective client. Nearly everyone hates unsolicited emails, except it’s an email that can solve a problem for them. If you have a niche already for your writing, you can send cold emails to companies in that niche which you think will benefit from your services. But please do some research on the companies beforehand to see whether you’re a right fit for them. Then find the email addresses of people in charge of their communications unit, and send them an email offering your services. You will be surprised that they will reply if they need you. If you have a lot of ideas then probably pitch multiple – but not more than five. You want to give your client choice, but not too many options that they won’t take time to read them all. Keep your emails as short as possible because people are busy! So make sure your pitches are fleshed out well. Networking is a good marketing strategy online and offline. You can find clients by just meeting up with fellow writers, collaborating with creatives in other fields, or keeping in touch with former colleagues. Being nice doesn’t only benefit you in the hereafter but also this world. Visibility is very important for a writer, and this is why we write often and for other people. Guest posting is writing blog posts for other people’s blogs, and it is a good marketing tactic because it brings your name and your service to the audience of that blog. It is advisable to write guest posts for blogs that your prospective clients visit. So, a writer for small businesses can guest-post for a top blog for startups. If you have a blog of your own, then guest posting can drive new audience to your work, who may not have known you otherwise. You can use your Facebook, Twitter, or Instagram accounts to get new clients. Engage your followers on topics related to your niche, and find other who have similar interests. Follow them, contribute to their conversations and use that opportunity to talk about your services. Remember that building genuine connections is important. Earning a halal income as a writer is a dream that a lot of people have. I personally consider writing as one of the most lucrative jobs of the digital age, and I believe that anyone can take these steps discussed to earn money if Allah (swt) wills. Author’s Bio: Amina Oke is a freelance writer for Muslim businesses, helping them to reach Muslim audiences through their blog content. Follow her freelancing blog (freelancingfromhome.com) for more information about working from home, or say hi on Instagram. Mashaa Allah this post will help alot of people. Beautifully written & beneficial post. This is such a helpful post! Love it! Saved it so I can come back later for future reference! I’m glad you liked it and even saved it. If you have any further questions, please feel free to get in touch with me. I’ll be happy to help. These are some really great tips. Freelance writing can be amazing as you have so much flexibility and get to work from home, but it can also be really hard starting out! It’s so important to go about it the right way or you can lose a lot of potential clients simply from not communicating the right way or not doing your research. Great post. You’re right, sis. Having the right info from the beginning is so important to a freelance writing career. This is such a. beneficial series. I know how hard and confusing things can be in the online world especially when starting out and most especially when you have certain standards to uphold as a Muslim/ah. Alhamdulillah… This will help many sisters unleash their potential as great writers. Thank you for the kind words, sister. You’re right, working online can be quite confusing. And I’ve noticed that it’s what makes people put off actually starting their online business. But with the right information and guide, it shouldn’t be as daunting as we think. I’m glad you found the post helpful. It’s a good thing that you’re already familiar with guest-posting. You can even build on that and focus solely on submitting guest posts to authority websites on behalf of your clients. The plus side of guest-posting is also that it increases your visibility to people who may be in interested in hiring you. I hope you look into the possibilities and commit it to it. Barakallahu fihi. Great advice. I wish there was something like this when I first started out. I had to do a lot of trial and error and listened to a lot of webinars. But it’s great that you have it all here for those starting out. Alhamdulillah.